Get directions Page opens in a new window. Schedule an appointment Page opens in a new window. You can set up a specific time to meet with a banking representative at this location. You can make deposits to your commercial account here. You can make deposits after business hours using the financial center's night depository. Night depository transactions are credited the following business day. Use your smartphone to withdraw cash, make deposits, check balances and more at our Cardless ATM. 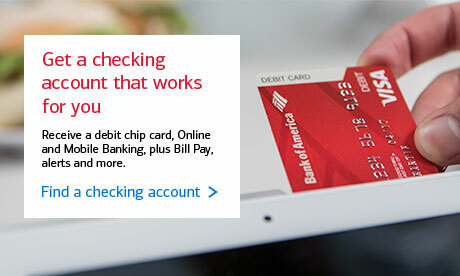 Set up is easy - just add your Bank of America debit card to your digital wallet. Learn more about digital wallets. Enter your debit card PIN on the ATM and start your transaction. This ATM also provides instructions in non-English languages. Banking products are provided by Bank of America, N.A. and affiliated banks, Members FDIC and wholly owned subsidiaries of Bank of America Corporation. Investing in securities involves risks, and there is always the potential of losing money when you invest in securities. Merrill Edge is available through Merrill Lynch, Pierce, Fenner & Smith Incorporated (MLPF&S), and consists of the Merrill Edge Advisory Center (investment guidance) and self-directed online investing. © 2019 Bank of America Corporation. You can click the Return to Bank of America button now to return to the previous page or you can use the Back button on your browser after you leave. 19 2019 1 22 2019 Financial centers will be closed on Monday, January 21, in observance of Martin Luther King Jr. Day. 2 16 2019 2 19 2019 Financial centers will be closed on Monday, February 18, in observance of Presidents Day. 5 25 2019 5 28 2019 Financial centers will be closed on Monday, May 27, in observance of Memorial Day. 7 2 2019 7 5 2019 Financial centers will be closed on Thursday, July 4, in observance of Independence Day. 8 31 2019 9 3 2019 Financial centers will be closed on Monday, September 2, in observance of Labor Day. 10 12 2019 10 15 2019 Financial centers will be closed on Monday, October 14, in observance of Columbus Day. 11 9 2019 11 12 2019 Financial centers will be closed on Monday, November 11, in observance of Veterans Day. 11 26 2019 11 29 2019 Financial centers will be closed on Thursday, November 28, in observance of Thanksgiving Day. 12 23 2019 12 26 2019 Financial centers will be closed on Wednesday, December 25, in observance of Christmas Day. 12 30 2019 1 2 2020 Financial centers will be closed on Wednesday, January 1, in observance of New Year's Day.